CHRISTMAS crackers are one of the finest traditions of the festive season, and there’s nothing better than those that hide beauty treats. 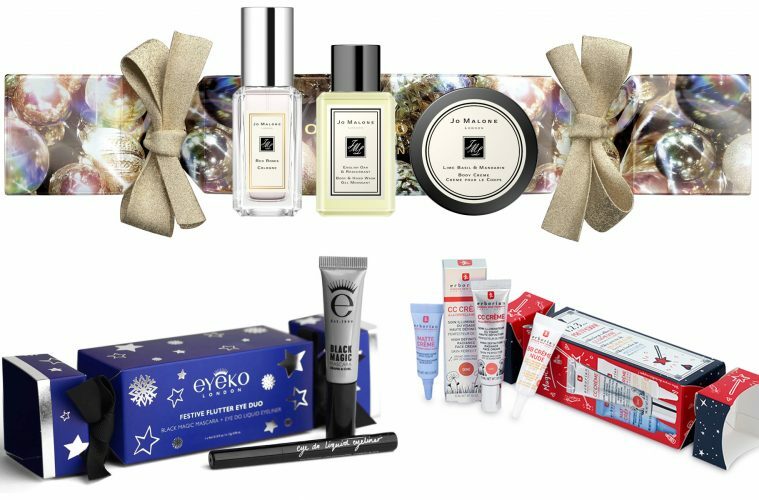 Beauty and the North East picks out 15 of this year’s best beauty Christmas crackers. This cute little cracker-shaped gift set houses four miniature treats from Aveda’s hair and body ranges – Thickening Tonic, Shampure Hand and Body Wash, Shampure Body Lotion and Blow Dry Accelerator. Fans of the famous bath bomb brand will love this trio of bath Blasters – Festive Fair Isle, Joy to the World and Tis the Season – guaranteed to bring some sweet-smelling chill-out time this festive season, all packaged in a joyful colourful cracker. Stay hydrated this Christmas with the trio of skincare treats inside this cute Caudalie cracker. Featuring Micellar Cleansing Water 30ml, Vinosource SOS Thirst Quenching Serum 10ml and Vinosource Moisturising Sorbet 15ml. This gorgeous little cracker from Clarins is a must for any fan and features two handbag-sized beauty treats – Instant Smooth Perfecting Touch Primer 4ml and an Instant Light Lip Comfort Oil in Honey 2.8ml. Keep your skin fresh and bright no matter how much you indulge with this skincare set in a cracker. Includes miniature Moringa Cleansing Balm, Moringa Renewal Treatment Mask and Cleansing Cloth. 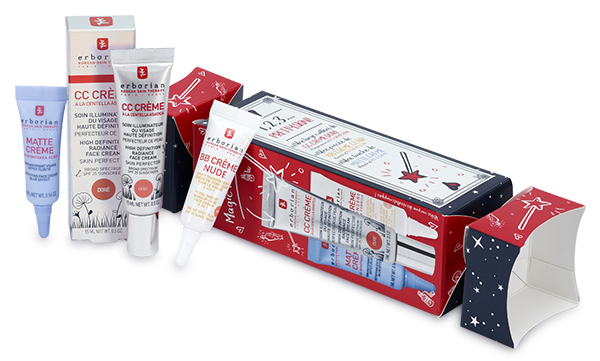 One of a selection of Christmas gifts from the cult skincare brand which harnesses the methods of Korean skincare. This pretty little cracker features three of its hero products. 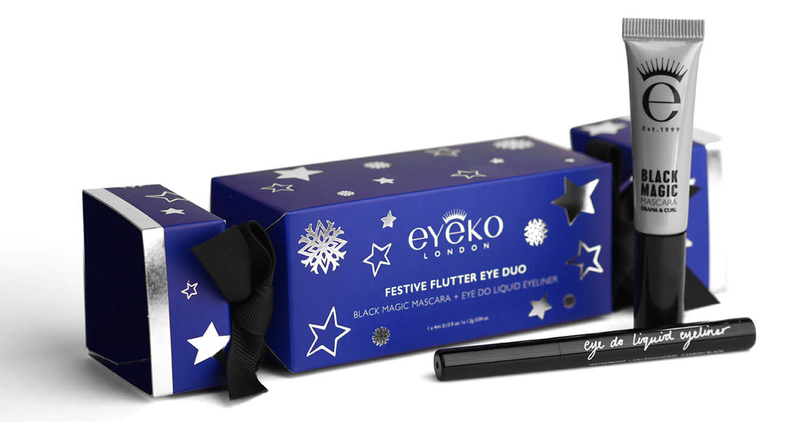 Get party-perfect eyes with Eyeko’s festive gift set featuring travel size Black Magic Mascara and Eye Do Eyeliner. 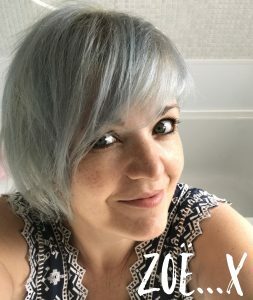 Not only does this glittery black cracker look amazing, it also houses a Rouge Interdit Vinyl Noir Revelateur Lipstick along with miniature size Noir Couture Mascara and Magic Kohl Liner. 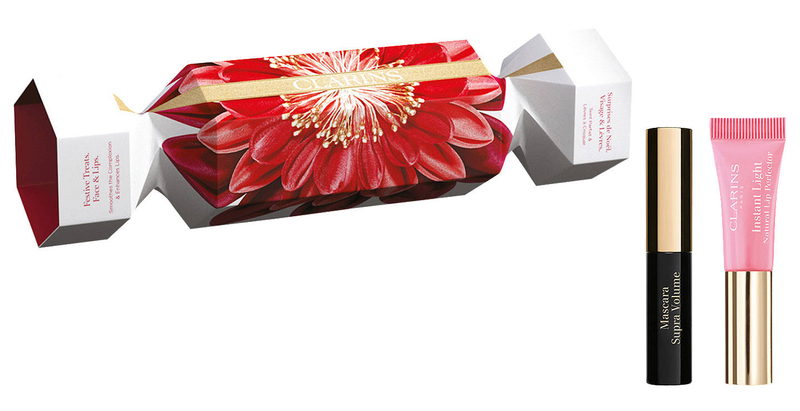 Enjoy miniature versions of three of Jo Malone’s leading products in a gorgeous festive cracker. Features Red Roses Cologne, English Oak & Redcurrant Body & Hand Wash and Lime, Basil & Mandarin Body Cream. 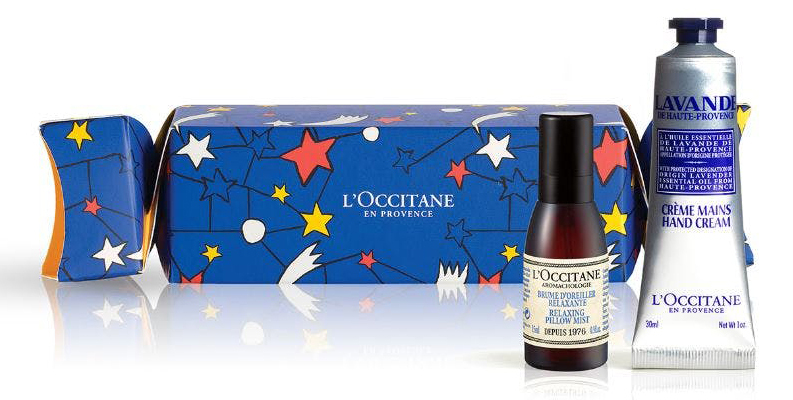 Pull a cracker of a relaxing treat with two gorgeous treats from L’Occitane’s Lavender range – Relaxing Pillow Mist and Hand Cream – packed into a colourful box. Give lips and lashes a festive treat with this gorgeous offering from Marc Jacobs. Featuring travel-size versions of Velvet Noir Major Volume Mascara and Le Marc Lip Crème in shade Kiss Kiss Bang. Crack open this gorgeous gift set to reveal four 50ml bottles of the brand’s fiery, fruity and floral bath and shower gels – Fiery Pink Pepper, Orange & Bergamot, Lily of the Valley and Rosa Absolute. 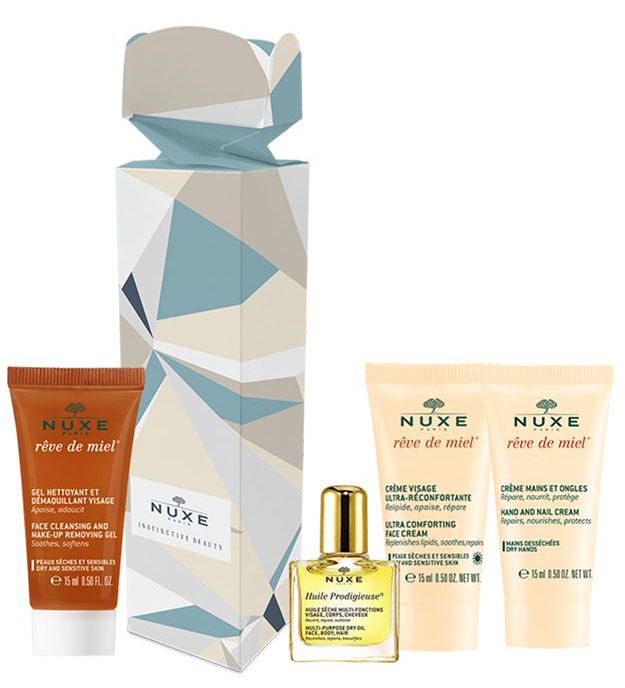 This funky little offering from Nuxe features four miniatures of its leading skincare treats – Reve de Miel Face Rich Cream, Makeup Removing Gel, Hand and Nail Cream and Huila Prodigious. Not technically a cracker, but this powerful duo gift from the haircare specialists looks great and features its best-selling Elasticizer 40ml along with a 60ml bottle of Daily Damage Defence. After a season whacking on the festive makeup, give your brushes a treat with this 150ml bottle of StylPro Cleanser which promises to cut through even the longest staying foundation with ease.